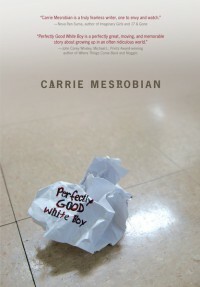 Disclaimer: I am friends with Carrie and I was a pre-reader for part of Perfectly Good White Boy while she was writing it. She gave me a copy of the books as a gift. I am not being compensated in anyway for this honest review. Trigger Warnings: The book contains mentions of abortion, and has two scenes with graphic depictions of animal death. The r-word (ableist slur for people with intellectual disabilities and/or Down syndrome) is used twice in dialogue. One of the things I love about realistic fiction is that it gives us an unfiltered view of life. Often that life is one that we have rarely seen portrayed authentically in fiction. In my opinion, realism in fiction is important, especially in a genre targeting young readers. That is not say that escapism is bad or of a lesser quality, but that both are needed to give readers the full spectrum view of life, the universe and everything.